James Wesley Hook was born November 18, 1936 in Waukegan, Illinois. Hook was a star player at Northwestern University also earning a mechanical engineering degree. The six foot two right handed pitcher was signed by the Cincinnati Reds in 1957, making his MLB debut later that same year. Hook made his debut pitching two innings of relief against the St. Louis Cardinals on September 3rd. On September 25th he made his first star, getting knocked out in the third inning after allowing seven runs (five earned) against the Chicago Cubs. He appeared in only four games over the next two seasons going 0-2 with an ERA over eight. By 1959 he got a starting role in the Reds rotation and went 5-5 with a 5.13 ERA. 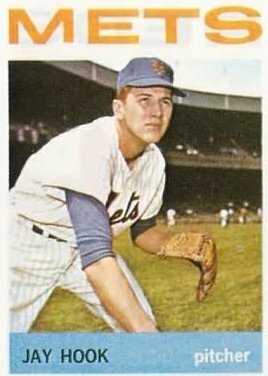 In 1960 he went 11-18 (second most losses in the NL) allowing a league leading 31 HRs with a 4.50 ERA striking out 105 batters in 222 innings pitched. He was put in the bullpen as a reliever for Reds 1961 NL Pennant season, going 1-3 in 22 games posting a 7.76 ERA, allowing 14 HRs in 62 innings. He did not appear in the ’61 World Series. 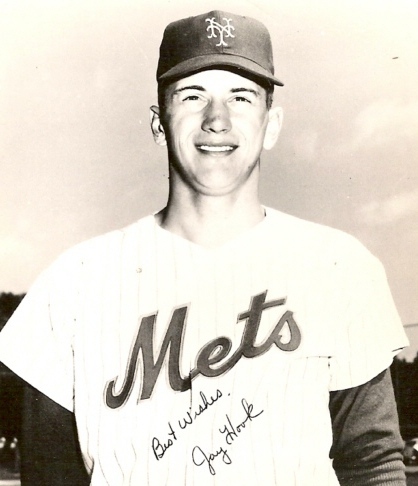 Hook was Chosen by the New York Mets as the third pick in the 1961 expansion draft. 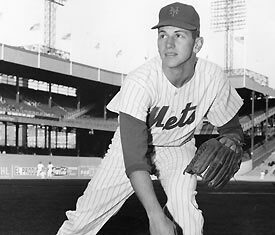 On April 17th 1962 he made the fourth start in Mets history, going eight innings at the Polo Grounds against the Houston Astros. He allowed two runs and struck out five earning no decision that day. In his next outing, it turned out to be a historic one. on April 23, 1962, Hook earned the win in the first victory of New York Mets history, in a win over the Pirates at Forbes Field in Pittsburgh. He threw a complete game five hitter, allowing only one run while striking out two, in the Mets 9-1 victory. 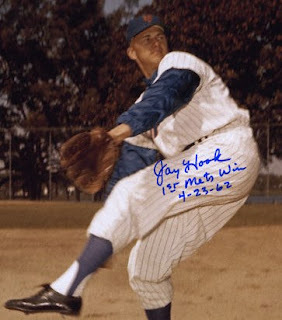 In his next outing Hook was knocked out in the first inning, after allowing four runs to the Philadelphia Phillies. In his fourth start he lasted just into the 4th inning, as he took a loss the Cincinnati Reds 8-2. On May 8th he got another complete game victory beating the Cubs at Wrigley Field 3-1. He had a few bad stretches on a bad team that didn’t score many runs, having two four game losing streaks throughout the summer and finishing up the season with five straight losses. He finished up the year at 8-19 (4th most losses in the league) with a 4.84 ERA. In 213 innings pitched, he gave up 230 hits, 71 walks & 31 HRs (4th worst in the league). He did lead the lowly staff with 13 complete games, 34 starts and 137 runs allowed. At the plate he was one of the Mets best hitting pitchers, a natural left handed hitter, he hit .203 with five RBIs & six runs scored. He started out 1963 losing his first five starts, and it didn’t get much better. He was moved to the bull pen for most of the second half of the season ending up at 4-14 with a 5.48 ERA. He had another good year at the plate and was one of the teams better hitters batting at .237 with an RBI & four runs scored. In 1964 after only three games and an 0-1 record he was traded along with Wayne Garrett’s brother Adrian to the Milwaukee Braves for shortstop & future coach Roy McMillan. He retired never pitching for the Braves with a career record of 29-62, 396 strikeouts in 752 innings pitched in 160 career games posting a 5.23 ERA. His Mets career record was 12-34 with a 5.22 ERA. Retirement: After his playing days, Hook used his mechanical engineering degree and worked for the Chrysler motor company. He then went to Rockwell International, where he was involved with the business operations for truck parts and subway undercarriages. After that he was a senior executive at Masco Corp. When he retired from corporate work, he taught manufacturing management at Northwestern University and bought a farm in Maple City, Michigan. My family met Mr. Hook at Sleeping Bear National Shoreline in Michigan today. He and his family were very friendly and helpful. FYI...We made it back up the dune. He wrote wrote an article in Sport magazine on how a curveball curves. To which Casey responded: "If he could only do what he knows."